Seasons are celebrated with festivals and marked with stories, songs and games that carry appropriate seasonal themes of animals preparing for winter hibernating or characters blossoming and changing. Some of our events involve the whole family, offering community-building opportunities; some are for just the children. All of our festivals are kept simple, fun and meaningful. The first celebration of our year is the festival of Michaelmas. Associated with the autumn equinox, this is a time when the earth draws into herself. The purpose of this festival is to celebrate human will, inner strength and courage. It is noted with puppetry and songs and a story of St. Michael’s struggle with the dragon and ultimately, through facing his challenges, his courageous taming of the dragon with his golden sword. The children enjoy baking “dragon bread”, using dried cranberries for eyes and pumpkin seeds for scales. Autumn comes and Halloween quickly approaches. This holiday corresponds to the “Eve of Samhain” in the ancient Celtic tradition. It was a time when the harvest was gathered and the fields lay fallow. Lore has it that the veil between the world of the living and the dead is most transparent during this time and therefore the spirits of the dead, fairies, witches and goblins carouse about in the night. 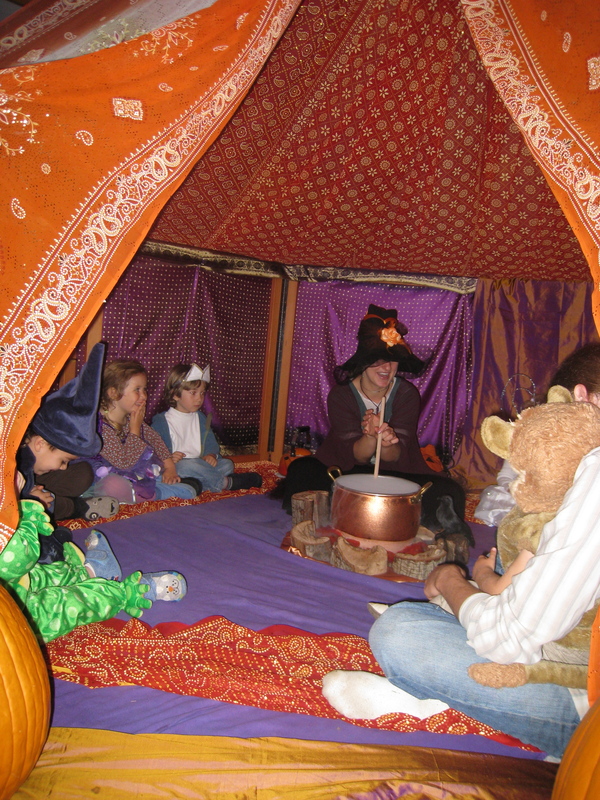 The children spend time preparing for Halloween. We scoop out our pumpkins and cook pumpkin seeds, carve jack-o-lanterns and listen to the stories of the mischievous goblin that sneaks into homes and puts salt in the sugar bowls, opens all the windows and hides everyone’s clothes. Further, he goes to the farms, pulls the cows tails, and makes a clanging with pails so that the hens will not lay eggs. The children learn that the jack-o-lanterns are used to scare off the mischievous ones by placing them at the doorsteps and in the windows! On the day of our festival, the classroom has been magically transformed and is filled with jack-o-lanterns. 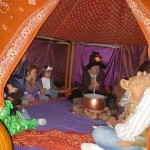 The children are surprised to find a witch has come to make her brew with us and tell us stories. Children come in simple home made costumes without face coverings or scary images. We welcome adventure, mystery, beauty, magic, and mischief. Our advent garden is a countdown to solstice, a celebration of light and the sun. Evergreens are decorated with crystals, shells, plants and carved animals representing the kingdoms of nature. This celebration reflects winter’s dark growing to a close and the renewed promise that spring light and life will begin again. We celebrate each day incorporating each of the kingdoms of nature and honoring each with it’s own song and verse. On December 6th we often celebrate a European tradition when the children get a surprise silent visit from St Nicholas and his helper, Rupert, who leave treats such as Golden nuts, oranges, and dates in each child’s shoes or slippers. 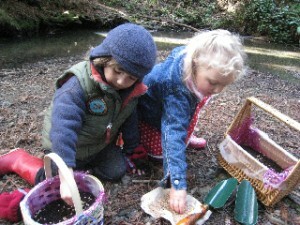 We might get lucky and spy a trail of glitter, showing us Nicholas’ way in and out of our garden! Spring is a time to celebrate birth and the return of spring. 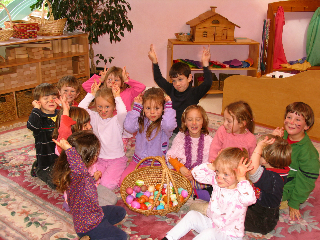 In the classrooms, children decorate eggs, tend to baskets of fresh green wheat grass, plant flowers and enjoy stories of the abundance of new life in nature all around us. In May, we celebrate the “coming in” of summer. 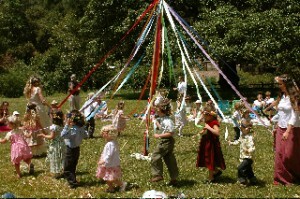 We celebrate with traditional maypole songs and festivities, which are woven into our dance and movement circles. Cold, dark days are long gone and we look forward to warmer days ahead. We celebrate the earth and life with flowers, music, singing and dancing. We may make May Baskets for our neighbors, or fashion garlands of flowers, or May crowns, for all children to wear. Each child, rainbow ribbons in hand, dances to the traditional songs and music. We ask parents to organize and help us to create a spring potluck for the entire community to come together for a day.